Head over to Facebook and â€˜Like’ Playskool. They have a few great printable coupons that you might want to use this holiday season. 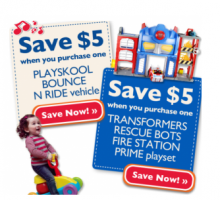 They have $5 off printable coupons Playskool for the Bounce N Ride Vehicle and the Transformers Rescue Bots Fire Station Prime playset. Amazon Mom Members Get 10% off Select Toys!